HomeServe NOT affiliated with RPU in any way! Rochester residents have recently started to receive letters from HomeServe offering water service line coverage. This is NOT affiliated with RPU in any way. RPU has service coverage available called Service Assured®. Water service cover is $1.99 or $2.99 for both water and electric coverage. Sign up for Service Assured® today! 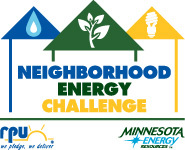 Two new Neighborhood Energy Challenge dates just announced! Sign up now for a neighborhood Energy Challenge workshop on Monday, September 17 or Monday, October 15. Learn how you can save energy in your home and how to be more efficient with the energy that you need. Click here for more information or to sign up today! You are currently browsing the Rochester Public Utilities | Behind the Meter blog archives for August, 2012.